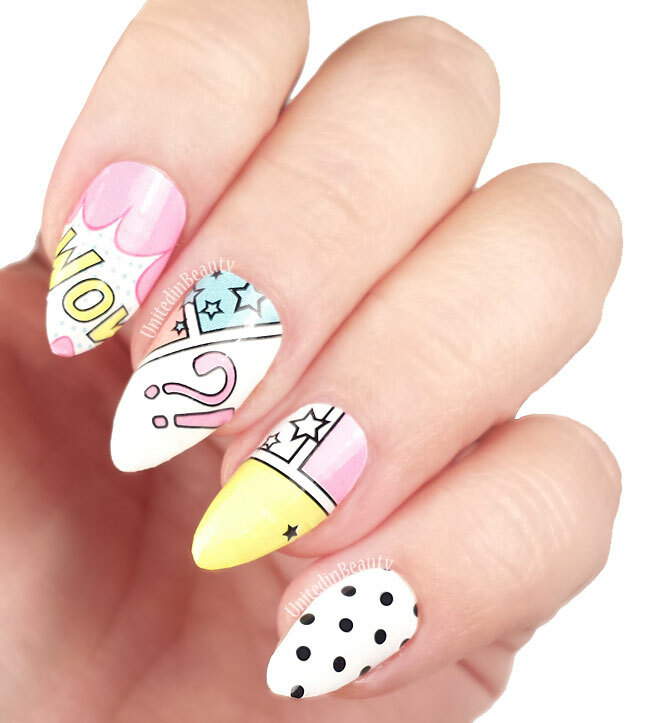 This cartoonish pop art nail wrap is my favorite right now, I love the pastel colors. As a sidenote, I'm really loving how much pop art designs are making a comeback in fashion right now, I'd love to get the skills to do some pop art greyscale makeup for Halloween this year! The second design is super cute! 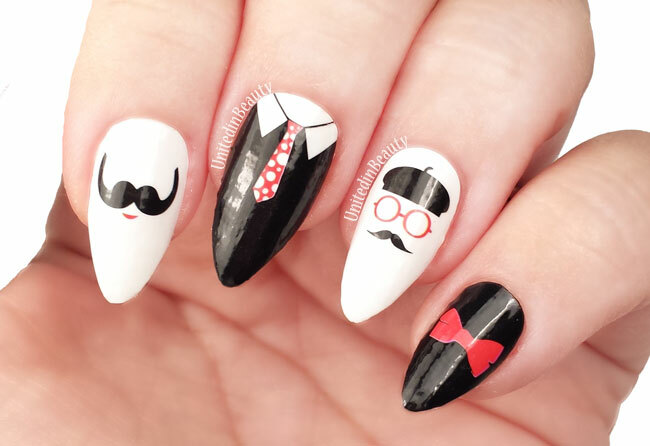 The set comes with a few different mustaches, a polka dotted tie, a bow tie, and a little beret. Adorbs! I got a lot of compliments on these the day that I wore them out and about while I was running a few errands and doing some shopping. 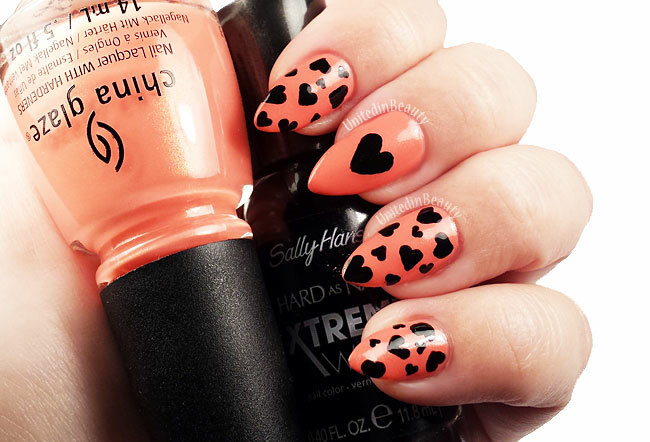 Nail compliments are the best compliments! Each pack retails for $7.99 and comes with 14 strips ranging in size from 10mm to 17.5mm, which means they can fit a wide variety of nail sizes. If you have short nails, you might even be able to get 2 full manicures out of each pack. At my nail length, I was able to get a full manicure and a pedicure done, which is a definite plus! You can pick up these two brand new nail wrap designs and over 100 more online at OMGNailStrips website. 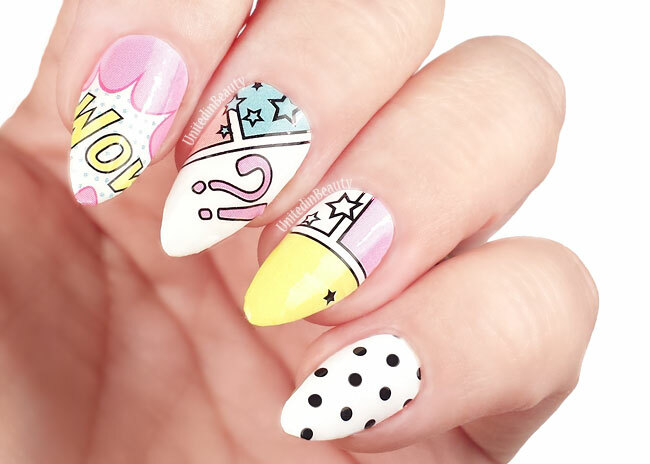 Have you ever tried any type of nail wraps before? Were they a hit or a miss for you, what was your experience? 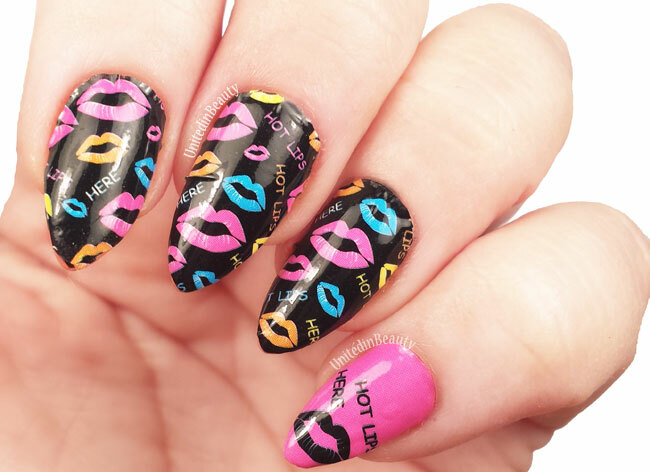 I am feeling the love today, how cute is this hot lips design?! 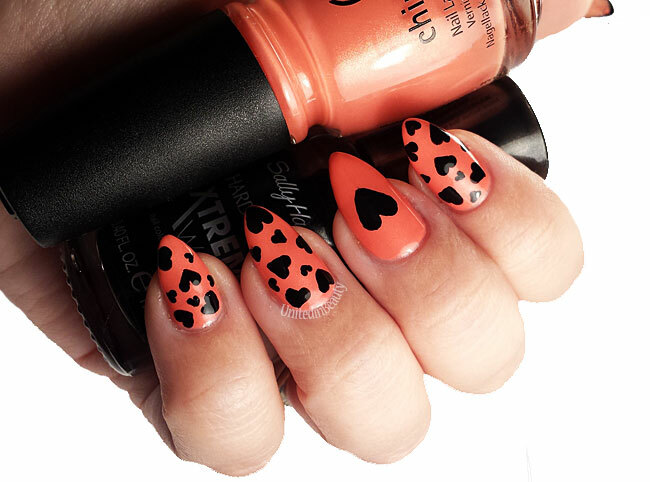 I decided since I'm on a roll with my Coral and Black Hearts Manicure, I might as well keep the party going with these. I mean a girl needs time to plan her nails, right?! It's not weird to spend an entire month planning how you will do your nails for just one day, is it? Not weird at all! 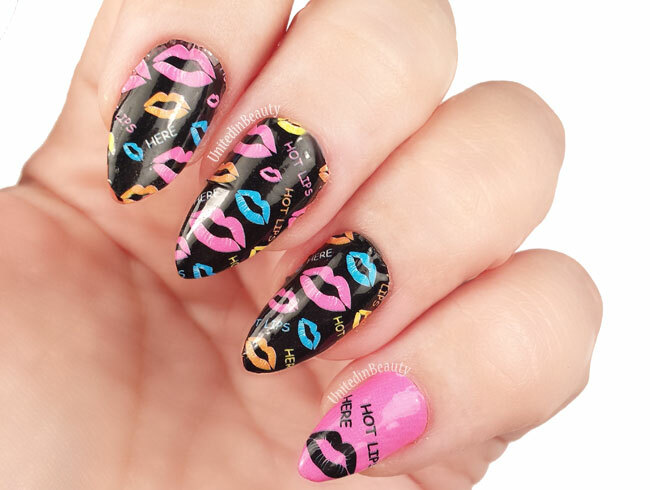 As a bonus, you guys are getting a sneak peek of these nail wraps from OMGNailStrips! These are not even available for purchase on the website yet, but they are coming up soon and I wanted to be the first one to show you all. Stayed tuned on the blog, because I've got two more unreleased designs that I have the pleasure of debuting to you guys! These are adorable, and are honestly my favorite brand of nail wraps. They fit my fingers perfectly, and are so easy to work with. I highly recommend them! Julia Goldani Telles chose a medium toned peachy pink polish to accent her gorgeous blue dress. While the shade is lovely, it's leaving a bit to be desired for me. I do find the dress to be stunning, though I think she could have really made her nails pop with a beautiful bright red to match the color of her lips. Chrissy Teigen picked both a stunning gown and a stunning polish, for me she stole the show! I am a fan of matching the nails to the look, and this was a perfect match. The accents of her gown are so intricate, the understated nails are spot on and exactly what was needed. Personally, I would have added a glitter gradient accent nail, but we all know I'm a girl that needs a bit of bling! Lupita Nyong'o also chose to let her purple floral Giambattista Valli Couture gown shine by choosing a soft pale pink nail shade with thin french manicure tips. As much as I love a good solid polish from time to time, I have to say that I am seriously feeling bummed at such a lack of nail art this year. Last years Golden Globes manicam showed tons of nail art, and I was really looking forward to a repeat performance. Katie Holmes did not disappoint, giving me the closest thing to nail art by using China Glaze Pelican Gray with a layer of Tinsel Town to create this gorgeous gradient. I love that her deep violet Marchesa dress is simple and she lets her glitter tipped shoes and nails bring the sparkle to the ensemble. Camila Alves, as beautiful as she is, unfortunately just did not wow me with this look. I really thought she was going to show up and blow the crowd away, but the smock topped dress didn't do her wonderful figure any favors, and this copper colored french manicure just left me feeling a bit meh. Jessica Chastain debuted one of the darkest nail hues of the night along with her bronze Atelier Versace gown. The photo makes it hard to determine, but it looks to be either a dark copper or a pure black polish. Ellie Kemper's ornate Naeem Khan frock was a huge YES for me! I loved the intricate beading and the small colored accents. I think she absolutely made the right choice with her classic bold red lips and matching manicure. How beautiful is this little budding fashionista? Quvenzhané Wallis is rocking both her perfect lavender manicure with white accent bow and her custom made Giorgio Armani dress. I love how they kept her look both fun and age appropriate! What did you think of the Golden Globes this year? Did you watch? We're this fashion and beauty looks hits or misses for you? The base polish that I used is two coats of China Glaze Mimosa's Before Mani's. Before I get into the rest of the details, I just have to say that man, typing out those grammatical errors HURT. China Glaze, You got some splanin' to do! Seriously though, take a good look at the next photo. See that? See those big glaring apostrophes that aren't supposed to be there? Believe it or not, the name of the polish really is printed like that. The first time that I saw it, I actually wondered if I received a badly counterfeit nail polish until good ole reliable Google showed me that they somehow meant to print them this way. Grammatically incorrect nail polish names? Can. Not. Deal. China Glaze - Fire whoever the head polish name printer is, and hire this girl right here. 'Nuff said. Rant and horrible grammatical errors aside, let's get back to business. This polish is the bomb. 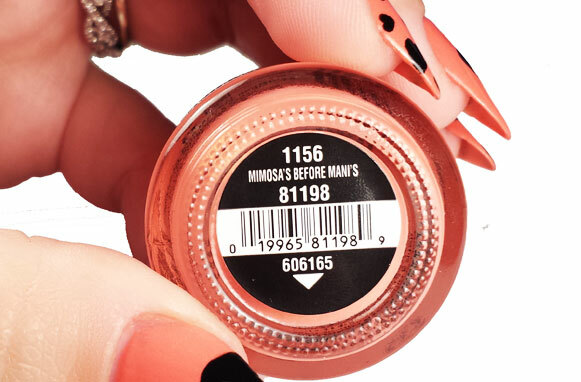 It's an AMAZINGLY PERFECT peachy coral shade that has just a hint of a fabulous gold shimmer to it. My camera had some difficulty picking up the shimmer on my nails, but if you take a good look at the bottle in my photos you'll be able to see it. I feel like I spent forever last summer trying to find a really great polish in this color. I must have about 10 different peach/pink/corals in my collection now, and I must admit that I love them all. 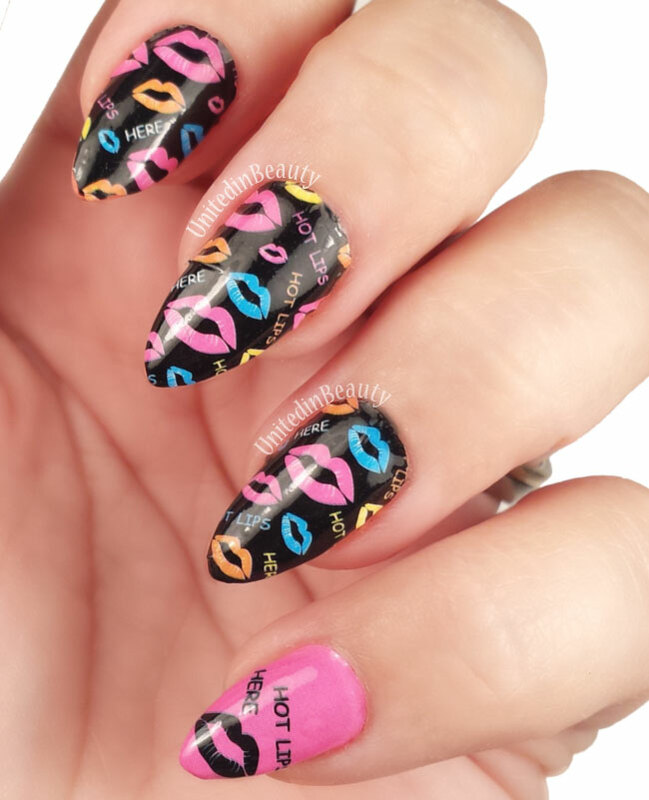 Once the Mimosa's Before Mani's was complete dry, I used my favorite black polish Orly Liquid Vinyl and one of the smallest detail brushes from my Royal and Langnickel RMAJ Detail Brush Set to hand paint the black hearts over top. 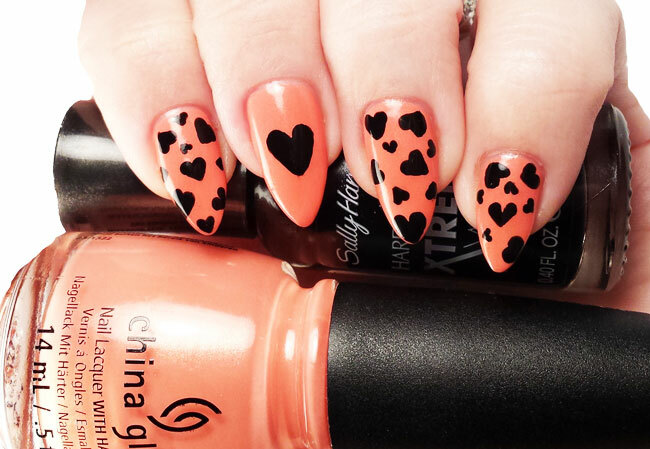 I let the hearts dry completely to avoid streaking, then topped with Seche Vite Dry Fast Top Coat. You may have noticed by now that my thumb is a bit camera shy, I often get asked on Instagram what is painted on my thumbnail so I figured today I'd share with you. 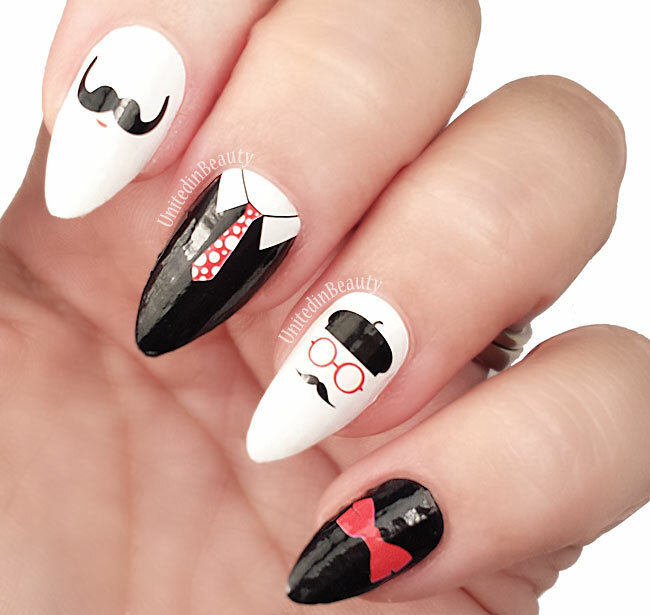 For this look, my thumb is painted with a black heart on the tip just like the ones in these red heart tipped stiletto nails. I'm not sure if you'll be able to tell, but I've been working on trying to improve my nail photos lately, and I tried a different technique for all of the photos in this post. Can you see a difference? I'd love any tips, tricks or suggestions you might have for me! Did anyone else rage out at the grammatical errors on their Mimosa's Before Mani's polish bottle? 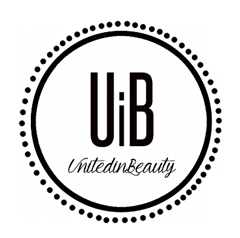 As always, don't forget #HeyUnitedinBeauty if you recreate or are inspired. I'd love to see! Nail Polish Giveaway - Win The ENTIRE Zoya PixieDust Collection! © United In Beauty. All rights reserved.